Andre Gray felt Burnley’s performance was deserving of more than a point against Hull City at the KCOM Stadium. 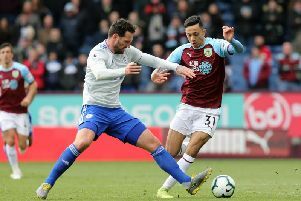 The Clarets are still searching for their first win on their travels in the Premier League this term but doubled their return away from Turf Moor with a 1-1 draw against the Tigers. Following the club’s 50th away game in the top flight, the striker said: “Considering the circumstances, going 1-0 down to a controversial penalty, it’s great to get a point. “I think we dominated; we had a lot of chances, maybe lacked a bit of quality but it was a good performance overall. “We’re happy. The first thing comes down to how we perform and in the first half we went out flying. We should’ve done a bit better in the final third. The 25-year-old almost added to his six league goals when breaking clear from Ashley Westwood’s pass in the second half only to pull his effort wide of the post. And the former Brentford forward felt that the Clarets would’ve claimed their first maximum of the term had they been more clinical in the final third. “Sometimes that happens, you get those games where it’s just the final pass but it’s something that we’ll work on,” he said. “We’re all still learning so it’s something that will come.